we stop the film for the WEREWOLF BREAK? See it ... solve it ... but don't tell! The millionaire Tom Newcliffe invites a group of people to spend some time in his mansion, along with his wife Caroline where he reveals that one of them is a werewolf, and therefore must be killed. The group is composed of; Arthur Bennington, Jan and Davina Gilmore, Paul Foote and Prof. Lundgren an archaeologist and a lycantropy enthusiast. They all stay in the mansion where they are submitted to various tests to force them to transform into a werewolf. The entire house is under surveillance by Tom and Pavel, who doesn't believe in werewolves. The only way to determine the identity of the werewolf is submitting the one to the full moon while the wolfsbane is mixed in the air. Tom makes them grab silver objects to provoke allergic reactions, but this proves unsuccessful. One night, Pavel is killed by the werewolf, which makes Tom more and more obsessive in finding the werewolf, driving his wife crazy. Tom focuses his suspicions under Paul Foote, who reportedly was arrested because he has eaten human flesh. Foote denies he is the werewolf. 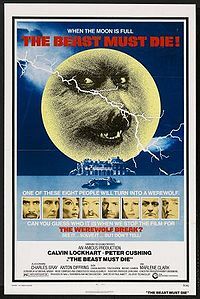 During one night, the werewolf kills the helicopter's pilot, Caroline's dog and Arthur Bennington in his bed. Tom submits the remaining group to one final test: put a silver bullet in the mouth. Caroline puts the silver in her mouth and starts to transform into the werewolf. She (fully transformed) attacks Tom and he kills her, making him very distraught because Caroline was alongside him when the werewolf killed her dog. Prof. Lundgren deduces that she contracted the werewolf disease while taking care of her dog's wounds. Tom gets angry and promptly thinks Foote is the werewolf, but Foote is also found dead. To avenge his wife, he enters the woods surrounding the mansion to hunt the werewolf. He finds the beast and kills it. The werewolf is revealed to be Jan, the pianist.